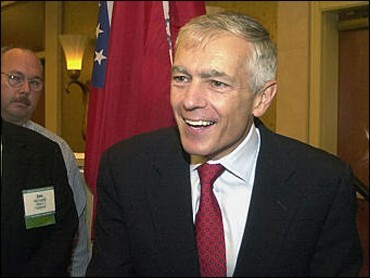 Democratic presidential candidate Wesley Clark backtracked from a day-old statement that he probably would have voted for the congressional resolution authorizing the use of force in Iraq, saying Friday he "would never have voted for this war." The retired Army general, an opponent of the conflict, surprised supporters when he indicated in an interview with reporters Thursday that he likely would have supported the resolution. On Friday, Clark sought to clarify his comments in an interview with The Associated Press. "Let's make one thing real clear, I would never have voted for this war," Clark said before a speech at the University of Iowa. "I've gotten a very consistent record on this. There was no imminent threat. This was not a case of pre-emptive war. I would have voted for the right kind of leverage to get a diplomatic solution, an international solution to the challenge of Saddam Hussein." Clark's initial remarks left members of his campaign team a bit flummoxed. "That caught me off guard a little. The general has been very critical of the war," said George Bruno, a New Hampshire activist. Clark launched his bid for the Democratic nomination on Tuesday with the type of media attention candidates crave, but early missteps underscore the dangers facing his late-starting campaign. The former NATO commander and his campaign staff went back and forth on whether he will participate in a Democratic debate next week — all in a single day. Creating more confusion were Clark's comments on the resolution that gave President Bush the authority to use U.S. military force to oust Saddam, remarks that were at odds with his opposition to the war. Veteran Democrats pointed out that Clark is in the unusual position of trying to put a major presidential campaign in place and clearly lay out his positions in the glare of the media spotlight. Other candidates have had months to hone their message below the political radar. "If politics were theater, you get to open in New Haven (Conn.)," rather than on Broadway, said veteran Democratic strategist Bill Carrick, who warned of the dangers of "policy on the fly." Added Carrick: "Howard Dean has been out there for two years rehearsing his act." Carrick compared some of the difficulties Clark has faced to the early days of Edward Kennedy's 1980 bid for the Democratic presidential nomination, also a late-starting campaign where the Massachusetts senator tended to blurt out comments that reshaped the race. Kennedy predicted, for instance, that he would beat President Carter in Iowa; Carter easily prevailed. Twenty-five years later those gaffes stick in Carrick's mind. "It completely changed the expectations," he said. "It was all triggered by the late start." The nine other Democratic candidates also have spent the last few months meeting with Democratic activists across the country, getting feedback on various issues and testing their campaign lines. "I'm sure Howard Dean has tried a variety of things along the way," said veteran Iowa activist Jeff Link. "By the time people began paying attention, he had it down pretty good." Iowa casts its votes in four months, giving Clark little time to smooth out the rough edges. "The question is, is he ready to jump into a huge national campaign that's just a few months away," Link said. "That is a pretty good sized organization with a lot of moving parts." In the interview, Clark sketched out a checkerboard of positions, saying he would leave in place a tax cut for middle-income Americans and indicating his support for gun rights, although he supports a ban on assault weapons. Clark said the helter-skelter effort to build his campaign was "like trying to bottle lightning," but he shrugged off the early stumbles. "It doesn't bother me a bit," he said. "It helps you get the message out across America. When you start late, you need that."